Known as ‘handsome Jack’, John Hayes St Leger commissioned this portrait the year he became a captain of the 55th Foot Regiment. The reds and pinks that give glamour to the clothing and sensuality to the face also add to the note of danger in the smoke of battle in the background. Reynolds engages the viewer’s visual memory to convey aspects of the character and appeal of the sitter. The composition recalls earlier examples of his work as well as antique and modern sculptures. 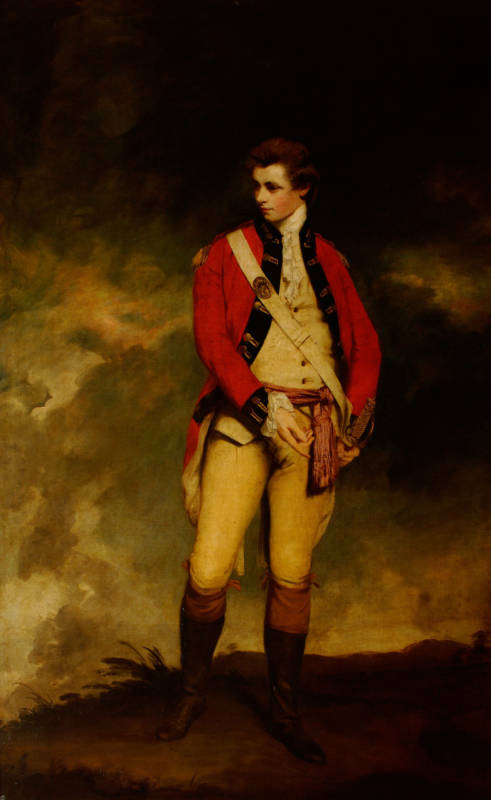 St Leger’s stance is a variation on that of the naval hero Commodore Augustus Keppel, whose portrait of 1752-3 launched Reynolds’s career – one hand on his sword, ready for action, the other leading the way. However, the tilt of St Leger’s head, the smudgy shadows at the corners of his eyes and mouth and the less assertive gesture of his right arm introduce a touch of tenderness to this portrait of a younger man. Recollections of classical sculpture elevate the physical beauty of this rakish soldier, whose stance invokes elements of the Apollo Belvedere, the Capitoline Antinous and the Meleager as well as a modern Apollo by the French sculptor Pierre Legros (1666-1719). 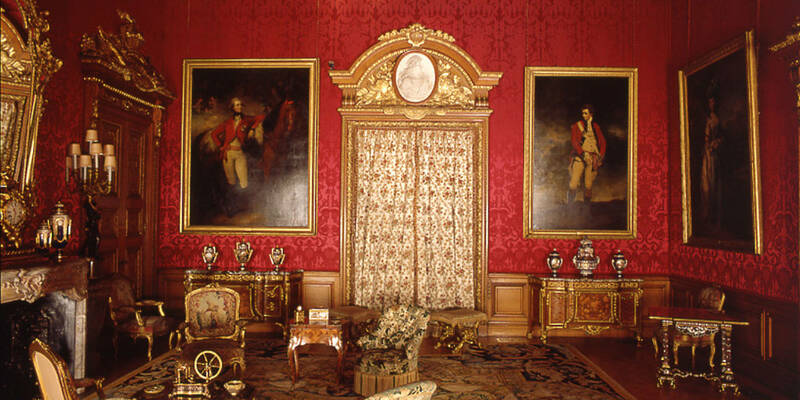 St Leger was a close friend of George, Prince of Wales (later George IV; 1762-1830), whose portrait by Reynolds’s great rival Thomas Gainsborough (1727-1788) hangs on the other side of the door. The three female portraits in the room are also by Gainsborough. In 1898 an article in the Daily Telegraph said: ‘nowhere is it more difficult to decide the much-vexed question whether Sir Joshua Reynolds holds his own against his overpoweringly brilliant rival, Gainsborough, or succumbs to the magic of his brush’ – perhaps the subject of conversation among Ferdinand de Rothschild’s erudite house guests.